I'm on a big stash busting and WIP busting mission. I have a ton of things planned with my stash. But the first is this sweater for my son that I had blogged about earlier. I realized variegated acrylic yarn does not do it for me anymore. I like the simpler and cleaner look of solid shades for kids clothes. So no more projects from the acrylic yarn after this. I like how the rocket turned out though. I've blogged about it here if you want to make your own motif. I'm using Elizabeth Zimmerman's percentage method from her Knitting Without Tears. It's knit bottom up, sleeves are knit separately then joined at the shoulders to start the raglan shaping. It's pretty straight forward until there. I'm still figuring out how to achieve the right neck depth without making it look weird. I've ripped it back twice after almost finishing the neck ribbing. I think the acrylic yarn has come to my advantage here because it maintains it's shape and elasticity even after ripping it so many times. It's a good prototype yarn. Next project in the making is Jared Flood's Umaro! 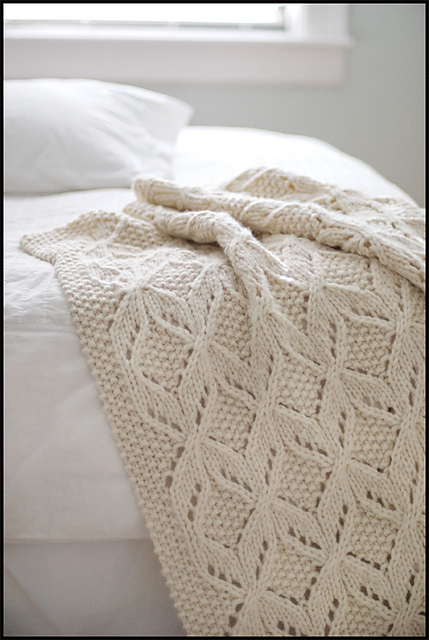 I just fell in love with this throw when I saw it. Making one for my DH with Cascade Eco +. I have 4 skeins, I hope that's enough to make one big enough for him. Now to announce the winners of the giveaway. I had a hard time picking names from all the wonderful and creative names suggested. So I finally picked two winners, yes there are two because I really liked the names from two different entries! Lilac Sun and Periwinkle! The winners are Mesuee and Lcubed! I'll get in touch with you to get your mailing addresses. First of all - I agree about the Acrylic yarn. Second of all - YAAAYYY! I'm so excited to be a winner! I'll watch my Ravelry message box for your notice.